Sleep apnea is the temporary pause in breathing due to your tongue obstructing your airway. This causes an intermittent lack of oxygen to the brain which is detrimental to health. This can also seriously disrupt your sleep partner. Different solutions are available. They vary from major surgery of the soft palate to the use of an external ventilator at home. For several years, patients more often go to their dentist to get an intra-oral device. 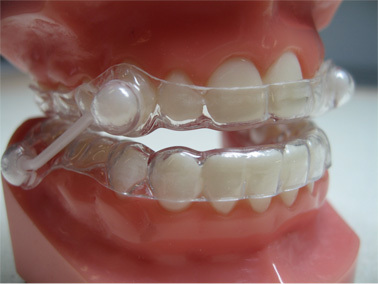 This device is a relatively simple splint that will help prevent snoring. It consists of two gutters connected by two small bars that can be adjusted. In many cases, this splint as well as lying on your side solves this problem. These splints are usually not supported by insurance.